A year ago today I started this blog. I'd been seriously thinking about it for the previous six months before I took the plunge, which is odd for me as I'm usually someone who once they decide to do something gets on and does it straight away. I suppose I was fearful of putting my thoughts 'out there', and feeling a tad inadequate compared to some of the lovely blogs I had been reading daily up 'til then (and still do). Anyway, on April 30th 2007 I finally took the jump into blogging and I have enjoyed it immensely ever since. I've 'met' some lovely people through this blog and it has meant that my family in Bristol get to 'see' more of my life here in Essex, which makes us feel much closer and connected. I'm rarely lost for something to say (as anyone who knows me in 'real' life could testify), and it has been so nice to feel part of a bigger online community, and to realise that there are many other people out there who share my love of charity shops, car boot sales, making things from vintage fabrics, and generally enjoying crafts. I've always enjoyed the thrill of finding something old and interesting hidden away amongst a load of old junk and have been frequenting jumble sales, car boot sales, charity shops etc etc since I was a teenager. Often work colleagues or friends thought I was a bit odd and/or seriously mean because of my love of all things second-hand, but I carried on regardless and, through the world of blogs, have realised that there are many many people out there just like me. Which is just lovely. I'd also been very keen on crafts when I was younger and had often knitted or sewn my own clothes. Had been a keen embroiderer as a teenager, tried my hand at both carpentry and silver-smithing, and just generally enjoyed making things. I don't know why I ever stopped doing these things really but gradually over the years because of lack of time and little inspiration I gave up all craft activities. Then I discovered craft blogs and suddenly I had so many ideas and so much to inspire me that my passion for crafting was renewed all over again. Anyway, as a celebration of my first year of blogging I'm offering one of my strawberry cupcake tea cosies as a giveaway. 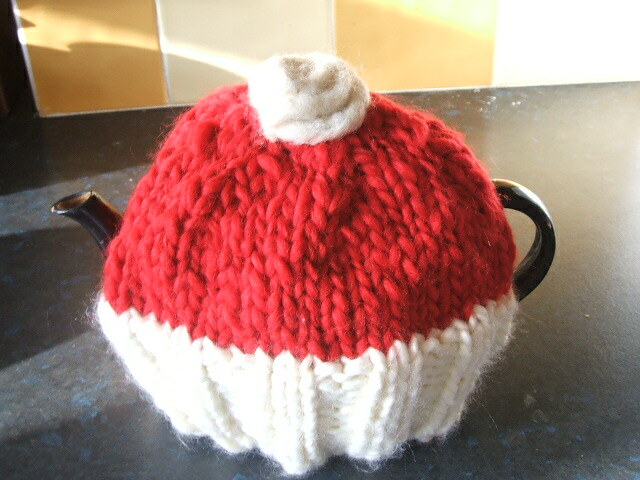 Made entirely from thrifted wool the tea cosy fits an average size (4 / 6 cup) teapot and has a thick cream base, strawberry-red pure wool 'icing', and a felted pure wool 'cream swirl' on the top. If you'd like to enter the giveaway just leave a comment on this post and I'll draw a winner after the weekend. Feel free to join in from anywhere in the world. One year old already? Congratulations and thank you for a very interesting and enjoyable read over the last year. Happy blog anniversary - I have been glad to have "met" you online! You always have thought provoking posts and great finds! I got your parcel the other day, thank you, so it's been added to the pile for the stall! Here's to another year! Happy Blogaversary! It's a lovely cozy. Why would your friends think you're mean for loving second hand things?